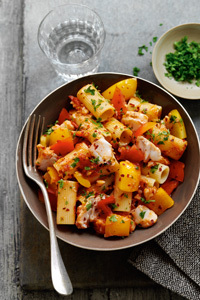 Try this Slimming World pasta recipe for a lovely low-calorie lunch or dinner. 1. Spray a large non-stick frying pan with low calorie cooking spray. 2. Add 2 finely chopped garlic cloves, the chopped tomatoes, passata with onions and garlic, chopped yellow pepper, a pinch of dried red chilli flakes and the dried oregano and bring to the boil. 3. Reduce the heat and add the cubes of skinless hake fillets, then simmer for 2-3 minutes until the fish is cooked through and season well. 4. Serve with cooked dried rigatoni pasta. Have some chopped banana stirred into a Mullerlight toffee yogurt for dessert.